Which NFL refs will get to work during the playoffs? The NFL playoffs are about the best of the best. It’s no doubt the best time of year, involving the best teams, the best players … and the best officials. So how are the officials selected? First of all, officials are graded every week for their performances and Week 17 was no exception. Games in Week 17 will be evaluated and graded on Monday and Tuesday. When the final calculations are made, the league will decide the postseason assignments, with the highest-ranking officials going to the playoffs. Officials will not be assigned by crews, they will be assigned individually. Yet, if officials do advance from the same crew, the league will do its best to keep members of a crew together. 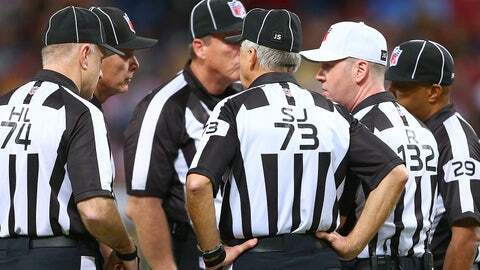 Officials will be assigned this Tuesday all the way through the Super Bowl. Those assignments will remain intact, unless an official who has an earlier game in the playoffs does something wrong that might take him out of the Super Bowl. I’ve only seen that happen once in XLVII years of Super Bowls. Super Bowl officials will work two games, the Super Bowl and either a wild card or divisional game. First-year officials are not eligible for postseason play and an official has to have at least five years experience with previous playoff experience to work a Super Bowl. The wild-card officials will be notified of their assignments Tuesday evening, so that they can get their flight reservations made and be ready to work a game on Saturday. The Divisional officials will be notified on the Monday after the wild-card games. The championship game and Pro Bowl officials will be notified about their assignments on the Monday after the divisional games. The Super Bowl notified of their assignments the Monday after the championship games. It’s a complicated system, but in the end, the league strives to get the officials who performed the best during the season into the playoffs. It’s playoff time … the best of everything.